I've just binge-watched most of Season 1 of the Netflix series "Narcos", chronicling the career of Colombian drug lord Pablo Escobar and the campaign by governments to bring him down. Escobar was an infamous mass-murderer on top of being a supremely successful drug dealer. Violent criminals are philosophically "anti-libertarian" or "Dionysian" and their astrological charts share features reflecting this. In the case of murderers, the Bloodbath Formula will virtually always appear in the birth chart. 1. Pallas square Jupiter, conjunct South Node, and ruled by Venus which is contraparallel Pluto. Moon-Jupiter-Neptune T-square: befitting a distributor of drugs. South Node conjunct Neptune and North Node in the Second House: converting drugs into money. I've seen the North Node in the Second in the charts of other successful businessmen (both legal and otherwise). 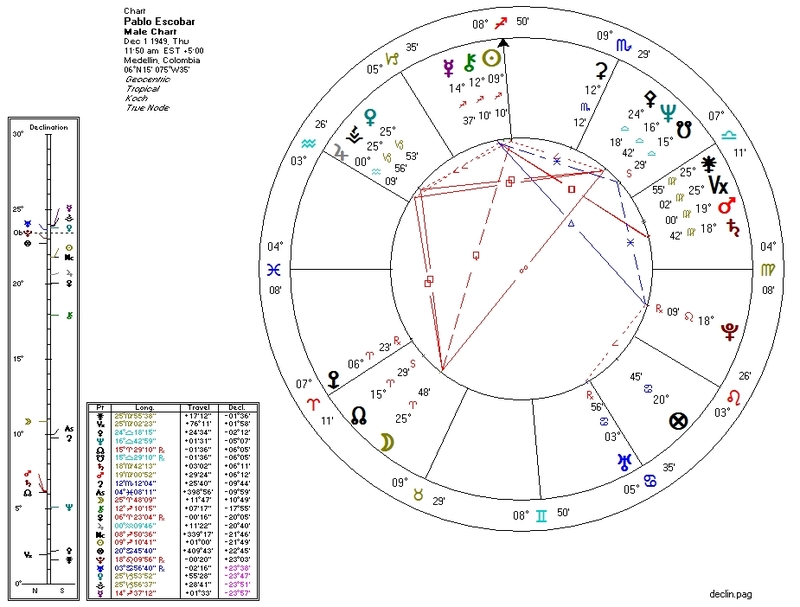 Mars conjunct Saturn in the Seventh: the Mars/Saturn connection seems to come up (in my experience) in the charts of builders of organizations. In the Seventh it may also suggest struggles with partners and enemies. Had Escobar focused more on his political career and less on his drug empire, he might have made less money but had a much longer career as a criminal. For the State is the most powerful criminal organization of all, and it will always neutralize or kill its competition.